©2008 Chiho Aoshima/Aya Takano/Kaikai Kiki Co., Ltd. All Rights Reserved. Kaikai Kiki Presents a Special Collaboration For The Coming Fall. Artists Chiho Aoshima and Aya Takano are also known for journeying to the “power spots” within their minds. Now these two visionaries, perhaps the most spiritual of all the Kaikai Kiki artists, have seen fit to visit TAKACHIHO themselves and have emerged to create a parallel universe with even more power than before. 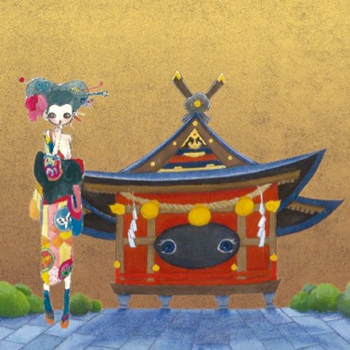 This fall, the very season of art, Kaikai Kiki presents a special collaboration to coincide with the opening of GEISAI. The un-Takachiho “AYACHIHO,” will be a tourist spot that you won’t want to miss.